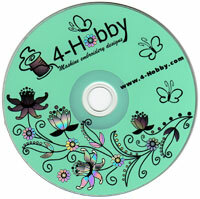 We are manufacturers and the sole copyright holders of all embroidery designs we sell. All of our designs are protected by copyright laws and nobody is allowed to re-sell them without becoming our authorised dealer. Stitching our designs on items/garments for sale is allowed! Find the item you would like to buy. You can do this either by searching the site or by choosing the category of the item on the left side of the page. Choose format (PES is the default). Add the item to your shopping cart by clicking the "Add to Cart" button. Go to your Shopping Cart by clicking "View Cart" at the right of the viewed page. Click on "Checkout" to fill in your name, e-mail address and shipping information. Choose the Payment method - Credit cards (2Checkout), PayPal or Gift Certificate. All orders received are usually processed and shipped immediately after payment is received. Sometimes delivery takes up to 12 hours. Our shop guarantees delivery of the order to the customer within within 12-15 buisness days by regular mail. Shipping charge is free for e-Mail shipping and $5 for CD-rom. If the disc is broken or you have reading problem, the disc will be replaced free.